You may wish to plant a potted calla lily in your garden or perhaps divide and replant some that are growing in your garden. This is a guide about transplanting calla lilies. I have a calla lily and was wondering if I can plant it outside now, in July? Or will that disturb it? I received a beautiful, potted, purple Calla lily for Valentine's Day. My husband said I didn't have a purple one, so he bought it for me. I have never received a potted Calla lily and I want to transplant it in my garden with my other Calla Lilies, but I'm not sure when I can do this. Do I need to wait for it to go dormant before putting in the garden? Or can I directly plant it as soon as the weather permits, just as it is? With planting season still 3 months away, I'm thinking it may go dormant by planting time. Also, what is the basic rule of thumb to know when to divide your Calla lilies, or do they ever need division? 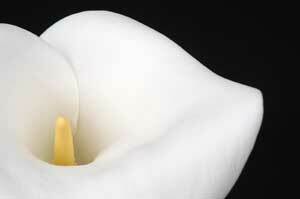 Picture: Calla Lily - Click the image for a guide to growing Calla Lilies. 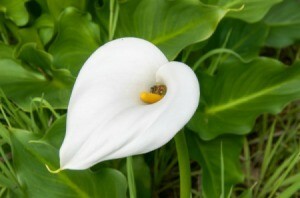 Q: Calla Lilies in my yard are growing 4 feet tall but as soon as they bloom, the flowers turn brown. I'd also like to dig them up and move them to another location in my yard. When should I dig them up? How can I prevent them from browning? And how do I get them to grow tall and straight? There are several things I don't know about your situation, so I'll do my best to speculate. Callas are native to swampy marshlands and need a lot of water, so make sure you are keeping their soil moist at all times. Morning sun and afternoon shade is the ideal, and apply a light organic fertilizer every 2 to 3 weeks during the active growing period, or simply side dress them with compost or well-rotted manure in the spring. You don't mention what color callas you are growing, but yellow and pink tend to be fussier than white and can be more difficult to grow. Some calla lilies exhibit a high sensitivity to salt (brown tips). Do you soften your water or use water with a fairly high salt content? If so, try switching to distilled water and see if that makes a difference. Floppy stems are usually the result of intense heat or underdeveloped root systems. In the late summer, callas naturally die back and more into a dormant period. Depending on the growing zone, this can last about 90 days. This rest period is the best time to transplant them.